Halloween: Pagan festival of ghosts, ghouls, goblins and witches. Ramadan: Muslim festival concentrating on themes of devotion, prayer, goodwill and charity. OK, I'm certainly not trying to be irreverent. I think I can explain this. We're over half-way through Ramadan and I've just learnt about "Gargaon". In my experience of Ramadan, there's a month of fasting followed by Eid ul-Fitr (celebration that marks the end of the Ramadan season). Apparently the way it works in Bahrain is that within the festival of Ramadan, there's a mini festival called Gargaon. Celebrated on the 15th day of Ramadan, the word Gargaon means "mixture of sweets, dates and dried nuts." On the evening of the 15th (after the Iftar - breaking of fast) children in traditional arabic dress, carrying drums and beautifully decorated bags, go around to the houses in their neighbourhood asking for gargaon (local kids must really like dates and dried nuts huh?). It's sort of like a local version of 'trick or treat' - without the tricks. A Bahraini colleague of mine has told me that sometimes people hold Gargoan parties for children and goody bags are beautifully decorated and distributed. There is also a kind or role play that goes on where someone performs the role of a knight on a wooden horse, called a 'Feraisa' who moves to the beat of a drum. I can't find any information on the origins of this story, might try and pop outside tonight to see if I can catch a glimpse of some action. 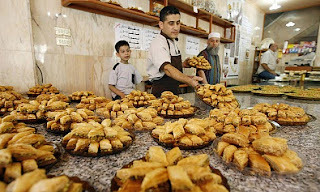 Above: Arabic bakery preparing for the pre-Iftar rush during Ramadan. Love your photo! I was initially struck by the patterns of the pastries, but when I zoomed in closer I saw the (presumably) 3 generations of the family (? ).